Our Do It Yourself Kits SAVE you BIG! Our DIY kits are designed to save you hundreds, if not thousands of dollars! Choose from any pre-packaged kit on our website or call our experts (we have over 25 years company experience and 70 years combined design and installation experience) and we will design a patio cover, carport, screen room, or sunroom to fit your needs. Consultation Service: Our experts are available to come to your home or business, take measurments and give you our recommendations for a $75 consulting fee. Why do we charge this? To keep our prices low and still be able to give you the highest level of service possible. Delivery Available: For only $99 in San Antonio and surrounding areas. We will deliver as far as Corpus Chrisiti, Dallas or Houston for an additional charge. Installation Available: Once you purchase your kit from us we will contact a local installer to set up installation for you. Typical installation prices range from about $3.00 a sq. foot on patio covers and carports to about $20 a liner foot on screen rooms and sun rooms. Call us for a no pressure, no obligation estimate 888 814-7531 (210 829-7531 local S.A.) - buy as a kit and install yourself or we will handle everything from installation to hanging that ceiling fan. Protect your vehicle from the effects of the san antonio sun with an aluminum or steel carport! Leaving your vehicle exposed to the elements can cause deterioration of your vehicles condition, fade the paint job and make the interior of your car very very hot during the summer days. Our single carports, double carports and triple carports are available in a variety of trim colors to compliment the colors of your home. Choose a carport kit and install it yourself to save money or we can handle the job from start to finish. Call us to set up an appointment for a no obligation, no pressure quote and get us started on a carport for your home or business. We offer single carports, double carports, triple carports.... as big as you need. We have been protecting vehicles in the san antonio area since 1986 with only high quality carports designed to withstand Texas weather. Shade your patio from the hot San Antonio sun with a patio cover designed to fit your needs. We will come to your home or job site and work with you on selecting a patio cover that will be a beautiful addition to your home along with providing shade for outdoor gatherings. Plus a patio cover can shade your house wall and save you money on cooling cost in the hot San Antonio summers. Call us for a free, no pressure, no obligation estimate 210 829-7531 - buy as a kit and install yourself or we will handle everything from installation to hanging that ceiling fan. We offer patio covers inclucing aluminum patio covers, insulated patio covers, flat pan patio covers, w-pan patio covers, steel patio covers & half patio cover - half arbor covers. We only use high quality materials which are easy to maintain with low maintenance and will last for years. A screen room can provide a comfortable place to enjoy the outdoors without the annoyances of bugs while providing much needed shade from the hot San Antonio sun. We can screen in your existing patio roof or provide a complete screen room custom sized for your needs. Our screen rooms come with aluminum extrustions and fiberglass screen. Solar screen is available. Have us install it for you or tackle the job yourself with our pre-assembled screen wall panel option. The wall panels come pre-assembled, pre-screened and ready to fit together making assembly easier than ever! Of course we are always available with free phone support if you get stuck. Call us - 210 829-7531 - to set up a free in-home quote for addresses in San Antonio, Texas and the surrounding areas. We will inspect the place where you wish to put a screen room, measure and go over the options you have. We have been in business in San Antonio since 1986 and are ready add you to our list of happy customers. We offer aluminum extrusion screen rooms with an aluminum roof, insulated roof, or use your exisiting roofing. All screen room kits are custom designed for your job. We only use high quality materials in your screen room that will have a long life with very little maintenance. A pergola is a great additon to your home or business to make the outdoors more inviting and to extend livable space. Pergolas add sytle, comfort, shade and a bit of upperclass architecure to your home. Pergolas were used in ancient Egypt, Greece and Rome plus pergolas are also commonly found in gardens throughout Europe. 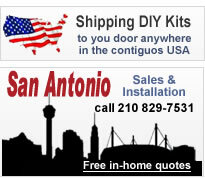 Call us - 210 829-7531 - to set up a free in-home quote for addresses in San Antonio, Texas and the surrounding areas. We will inspect the place where you wish to put your arbor or pergola, measure and go over the options you have. We have been in business in San Antonio since 1986 and are ready add you to our list of happy customers. We offer aluminum pergolas / arbors pre-sized kits or custom designed for your site. With many options available we are sure we can design the perfect arbor / pergola to fit any setting. This article was published on Friday 28 May, 2010.